The Veteran Women's Enterprise Center was proud to join the Veteran Women Business Owners United (VWBOU) Wednesday's Winning Women series. In October, VR Small, Executive Director for VWEC helped toast National Businesss Women's Week and shared the efforts underway in planning for "Women's Veteran Day 2018: Celebrating 70 Years of Service. 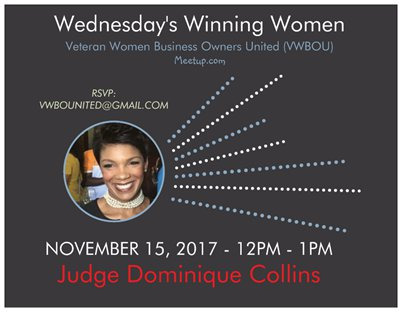 Wednesday's Winning Women on November 15th, will welcome special guest speaker Judge Dominique Collins. This dynamic, inspiring Retired Air Force Veteran will share her journey as a women who is winning in her personal and professional life. Join the VWBOU for their Winning Women Series providing the tools for you to develop a personal/professional winning game plan, while connecting with like minded women veterans and patriots. HAPPY VETERANS DAY -- REMEMBERING SHE SERVED TOO!